A last-second defensive stand by the Concordia Stingers defense allowed the team to pick up a 17-11 victory against the St-Francis Xavier University X-Men on Sept. 24 during homecoming at Concordia Stadium. The Stingers came out of the gate fast, taking a 9-0 lead just five minutes in, after a touchdown by Stingers wide receiver James Tyrell and an X-Men safety. The X-Men would end up finding their groove later into the first half, eventually taking an 11-10 lead deep into the second quarter. The Stingers came back with a field goal by kicker Andrew Stevens, and added a point from a missed field goal to take a 14-11 lead going into halftime. In the first half, the Stingers only generated 186 yards of total offense. Stingers head coach Mickey Donovan, said the offense needs to get better and it has been struggling for the last few games. In the second half, the Stingers opened with a field goal to bring the score to 17-11 and relied on their defense to hold the lead for the rest of the game. The X-Men were unable to get deep into the Stingers zone and were kept to 353 yards of total offense. 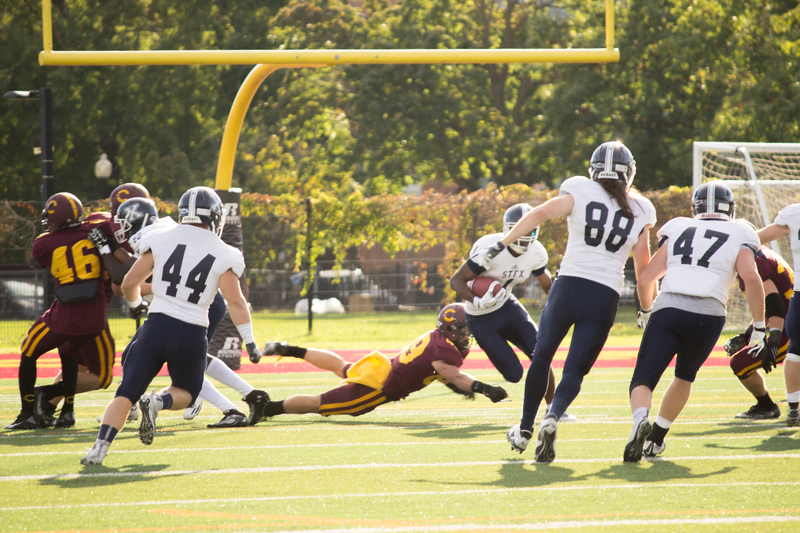 During the X-Men’s final possession, the team was finally able to chip away at the Stingers defense, and with four seconds left on the clock, the X-Men had one last play to steal the win from the Stingers. Concordia will take on the Bishop’s Gaiters in their next match. X-Men quarterback Tivon Cook threw the ball into the end zone but it was batted down by a Stingers cornerback. Despite being disappointed in his team’s performance, Donovan was happy that his team picked up the win and brought their record up to 2-2. The Stingers next game will be against the Bishop’s Gaiters in the Shrine Bowl at home on Oct. 1.